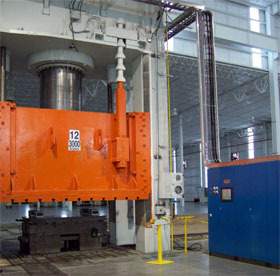 A hydraulic press is a complex machine which can be overwhelming for an operator or integrator who is not familiar with the hydraulic system. While a bit intimidating at first, the benefits of a hydraulic press can overshadow the cons dramatically. 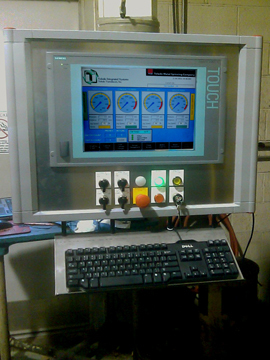 Toledo Integrated Systems has successfully integrated numerous hydraulic press controls throughout North America. We're able to provide you with the knowledge and experience that you're looking for in a company to update your existing hydraulic press controls. Along with the basic PLC and HMI design, engineering and integration, we're also able to offer custom integration ranging from press interlocks to interfacing with other parts of the hydraulic press line such as the feeder or transfer systems. Below is a general list of what can be included with our hydraulic press control solution. As with many of our products and services, each package can be custom designed and integrated to fit your needs. If you would like to know more about our press control solutions or have any questions, contact us using the form below or at 1-800-TTOLEDO. 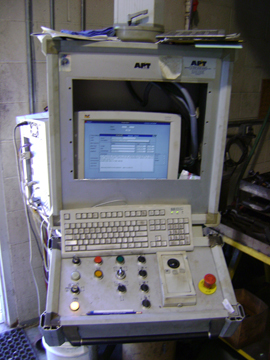 Scope: The original hydraulic press controls both utilized obsolete HMI software that would only run on Windows NT. After years of service, the operator screen failed and was a major inconvenience to replace. As technology advanced, it became practically impossible to replace the operator screen that would run the original software. Combine that with the continued distributed I/O issues and "non-friendly" screens, it was an easy choice for this customer to upgrade. 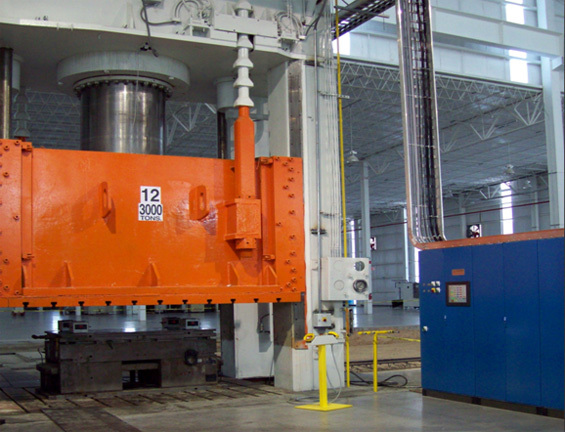 Toledo Integrated Systems was to design, build, program, install and commission new hydraulic press control systems for a 250-Ton and 400-Ton APT Hydraulic presses. These control systems replaced the existing operator screens and existing PLC controls including all distributed I/O. The new systems utilized Siemens S7-300F series SAFE processors, SAFE I/O, distributed Siemens Profibus I/O and 15" color touch screen Siemens Panel PC's running WINCC Flexible. The application software rewrite included all pre-existing functions along with enhanced "operator friendly" screen layouts and diagnostics. The supplied hardware and software provided expandability and customization to add production and downtime reporting in the future. Method: After installation was completed, the next step was to verify all emergency stop and safety circuits. Once all of the safety circuits were verified, along with an I/O check, the two main variable volume pump controllers were tested, calibrated and checked for any problems. Once the main pumps were calibrated, the team was able to continue commissioning the press control. 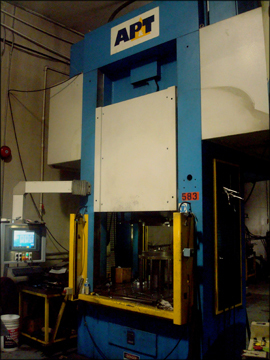 These specific APT hydraulic presses have four (4) cylinders, two downward and two upward acting. These four cylinders can be programmed to work independently with regard to speed, stroke length and force in any sequence. This feature makes it possible to use infinitely adjustable blank holder force and to create reverse draw and redraw operations. The new press control allowed for an easier, faster setup as well as recipe storage that stored each of the four cylinders proportional values for each specific job. Results: The finished project was a success. We were able to incorporate all of the existing features of the original press control as well as the added features desired by the customer. Setup times were reduced not only because of easier to navigate screens, but also utilizing the new operator touch screen control. Both presses are fully functional and most importantly, up-to-date with regards to OSHA and ANSI standards. Scope: A 350-Ton hydraulic press needed updated press controls. Our assignment was to bring these controls up-to-date with the latest hardware and safety features, along with making the press run as it had before the update. All controls were to be ANSI, OSHA and CSA compliant. Method: After removal of all unneeded wire and components, we installed and mounted all of the new field and control hardware, along with the new enclosure. Once in place and wired, we were able to apply power and verify all new and existing connections. After our I/O check was successful, the analog vales were tested and calibrated. For this specific press, four (4) analog valves controlled the ram position and speed. This particular application required two (2) zones to form the part. Each required a different ramp speed, however the same tonnage was applied throughout each zone. Also required for this project was robot interlocking. For this specific press, a single robot was used to transfer the blank through each of the stations (3 total). The press was programmed to run at a slow speed during the stroke until the signal was sent from the robot confirming it was in the return position. Once at the home position, the ram would increase in velocity and form the part. Results: The finished project was a success. We were able to correctly tie all existing and new components together and interface successfully with the robotic transfer. 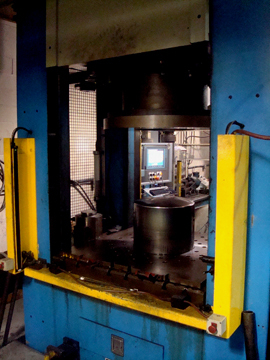 Scope: This hydraulic press was being moved from Ohio to Monterrey, Mexico and Toledo Integrated Systems was contracted to provide a turn-key OSHA & ANSI compliant press control system. Our services required a removal of all unneeded electrical components and wires, re-wire the entire press and automation system, update the controls, automation system, safety circuit and HMI, re-commission the press and provide training for the new operators and maintenance personnel. Method: : After removal of all unneeded wire and components, we installed and mounted all of the new field and control hardware, along with the new enclosures. Once in place and wired, we were able to apply power and verify all new and existing connections. After our I/O check was successful, the main pump variable volume controller was calibrated and checked for any problems. Once the main pump was calibrated, the team was able calibrate tonnage and then incorporate the customer's specific control process. This particular application required five (5) zones to form the part. Each zone required a different rate to tonnage, tonnage and duration. Once the five (5) stages were completed, the ram would automatically open to a settable opening and the part would be sprayed with a coating substance, IMC (Injection Molding Compound). After spraying, the part would run through five (5) more zones at which point the finished part would be ejected. Results: The finished project was a success. We were able to correctly tie all existing and new components together after the transplant. We were also able to beat our deadline during the run-off.